Pain felt in ISRAEL radiates to all capitals of the WORLD! As we watch all the events concerning Israel’s future unfold before our eyes and rapidly coming to a climax… we ask ourselves… "What lies ahead?" The late Derrick Prince once said, "To understand Jewish history was something like a river whose course had been affected by an earthquake. The greater part of its water had descended into a chasm created by the earthquake, where it continued to flow. Because its new course was mostly underground, many people assumed that the river had ceased to flow altogether. For those who knew that the river was still flowing were not aware of the exact course it was following. Towards the end of the nineteenth century, however, the river of Jewish history emerged once more into the landscape of world history, producing a powerful impact on culture, science and politics… an independent Jewish State in their historic homeland, Israel. Though the river first re-emerged as a seemingly insignificant trickle, it gained steadily in volume… until its impact was now being felt throughout the Middle East." For a Gentile believer of the twentieth century, prophecy concerning the future of Israel may seem unimportant… However, from a prophetic prospective, the future of Israel is very important. One of the main causes for current confusion and understanding prophecy is the failure to take Israel – related prophecies literally. Attempts to transfer the promises relating to Israel to the church have been a major obstacle to understand God’s prophetic purposes as a whole. Once prophecies about Israel are distinguished from prophecies concerning the church or the Gentiles, the main programs of God as outlined in prophecy begin to be clear. One amazing feature of biblical revelation is the prominence it gives to the tiny strip of land at the east end of the Mediterranean, originally known as the land of Canaan – today Israel. Most of the events recorded in the Bible as history, or predicted as prophecy centre around this land. In particular, it is the focus of a series of statements contained in Psalm 105: 7 – 11. This passage opens with the declaration of God’s supreme authority over the earth: "He is the Lord our God; His Judgements are in all the earth," (Vs. 7). The God of the Bible is Lord over the whole earth… the judgements He pronounces do not apply just to one nation or one little piece of land. His authority extends to all nations and the whole earth. However, God has made a special, unique commitment to one human family, descendant from Abraham. This commitment is summed up in verses: 8 – 10: "He remembers His covenant forever; the word which He commanded, for a thousand generations. The covenant which He made with Abraham; And His oath to Isaac; and confirmed it to Jacob for a statue, to Israel as an everlasting covenant." What an amazing Scripture! We know of no other passage that combines so many words that expresses a solemn commitment of God: covenant, word, commandment, oath, statue, everlasting covenant. There is no language used in the Bible that could more strongly emphasis God’s total commitment. Israel is in a very dangerous position. The United States has lost her Arab ally base whose central target and concern now is Israel. The Middle East is a more dangerous place due to the acquisition of weapons of mass destruction. Russia, China and Turkey are flexing some muscle in the region on sides of those nations apposed to Israel. The UN continues to exert increasing pressure on Israel. The EU and many other entities press for International peace monitors. The whole Middle East region is on the verge of war, which is now even more likely, since the US has declared war on terrorism. A lot has changed in the past ten years, and the results have become a great example of not knowing the importance of God’s covenant land. To this day, there is but a small group of people in the world who are aware of the seriousness of partitioning, trading or tampering with Israel’s covenant land. One only needs to look what has happened since the first peace process began. Many of those responsible have been taken out of the way by death, or they have lost their political office. Meanwhile the situation in Israel and the Middle East has worsened dramatically. In the past few years, most of Israel’s Arab neighbours openly avowed to be enemies of Zion, have obtained weapons of mass destruction. Moreover, China is now supplying arms to Libya, Iran and Syria. Russia continues to supply weapons to Syria and has signed agreements with Libya and Iran… while Turkey is flexing her Islamic vocal cords of threats against Israel. Turkish Prime Minister ErdoÄŸan has threatened to send Turkish warships to protect protesters in a flotilla vowing to break Israel’s blockade of the Gaza Strip. This latest Turkish power play is about nothing more than trying to infringe on the rights to the potential oil supply recently discovered by Israel in her regional waters. If Israel retaliates by protecting her Oil and Gas fields… then this would give Turkey the reason to respond with a strong military action against Israel. China has an enormous appetite for oil and is continuing to increase her influence in the Middle East. China enjoys being an obstacle to the US, whenever and wherever possible and continues to intentionally not see "eye to eye" with the US on so many different occasions. For example recently at the UN Security Council, voting in favour of a Palestinian state and voting against action to be taken against the ‘rogue state of Syria’ slaughtering hundreds of Syrian anti-government protestors. Syria; For the past few months, Syrian President Bashar Assad has staved off a military attack by Turkey or NATO for halting the exceptional brutality of his crackdown on protest by explicitly holding Greater Tel Aviv's 1.2 million inhabitants under threat of missile retaliation. Iran and Hezbollah are exercising the same deterrent. Syria, Iran and Hezbollah have charted a coordinated military operation for flattening metropolitan Tel Aviv, Israel's financial, industrial and cultural centre, with thousands of missiles launched simultaneously by all three - plus the Palestinian Hamas and Jihad Islami firing from the Gaza Strip. Israeli officials reacted with a warning of its own: "If a single Syrian missile explodes in Tel Aviv, Damascus will be first to pay the price, and if the missile offensive persists, one Syrian town after another will be destroyed." The Israeli message to Assad cited the warnings Defence Minister Ehud Barak and other government members addressed in the past year to Hezbollah, that if Tel Aviv comes under attack from its missiles, not only Beirut but all of Lebanon would go up in flames. Assad was given to understand that Syria would go the same way as Lebanon if it engaged in missiles against Israel. Syria and Turkey are increasingly at odds and the rift between Syria and Turkey plays into the hands of the Syrian ruler and grants him the freedom to issue dire threats against Israel to hold Turkey and NATO back from using military force against his vicious regime. The Syrian ruler's response in October 2011 was harsh: From the moment a shot is fired against Syria, "it will take only six hours for Syria to devastate Tel Aviv and ignite the entire Middle East." The barrage of Syrian threats was reinforced from Tehran (September 26, 2011) by Ayatollah Jafar Shoujouni, a close associate of the all-powerful Supreme Leader Ayatollah Ali Khamenei. Shoujouni recalled that when he visited Hizballah leader Hassan Nasrallah in Beirut last May, he assured him: "If Israelis come near Tehran, we will destroy Tel Aviv." "The burden of Damascus… Behold, Damascus is taken away from being a city, and it shall be a ruinous heap.... And behold at evening tide trouble; and before the morning he is not. This is the portion of them that spoil us and the lot of them that rob us" Isaiah 17:1, 14. Damascus, the capital of Syria, is known to be the oldest continuously inhabited city in the world! It has never yet been "taken away from being a city." Its destruction is therefore a future event, and is likely an event that is pre-tribulation. Damascus is the International headquarters for virtually every Middle East terrorist organization. The absence of Syria from the Magog coalition indicates that the prophesied burden of Damascus event is a sequence of events that prefigures in time the Magog invasion. It is highly likely, given the present geo-political world situation and the strategies involved in the American-led war on terror that Damascus will be devastated either by Israel, the US, or become victim to an international nuclear exchange, as the war on terror proceeds... As described in: Isaiah chapter 17, Jeremiah 49:23-27 and elsewhere..! In the 20th Century the rise and fall of Russia has been a major factor in world history and Russia will continue to dominate the centre stage. For the purpose of prophecy, Russia will be the designation for the great power to the North of Israel. The dramatic prophetic picture of Russia’s bid for world conquest, as recorded in Ezekiel 38: 1 – 39:24 set in the context of prophecies that relate to Israel’s restoration. In Ezekiel 37:1 – 28 Israel’s restoration as a nation and her resurrection from the dead at the time of the Second Coming are described in the symbolism of the "valley of dry bones" being brought back to life. After the description of Russia’s war in Ezekiel 38: 1 – 39:24 a further prophecy is made concerning Israel’s re-gathering to her land as a phase of her resurrection. Although Israel has military superiority over the countries immediately surrounding her, the possibility of a Russian attack has long been her fear. The ancient enemies of Israel are the enemies of Israel TODAY! In October 2011, the Prime Minister of Russia, Vladimir Putin has unveiled a grand vision to create a "Eurasian Union" linking old Soviet neighbours, foreseeing a ‘powerful, multi-national union, capable of becoming one of the poles of the modern world’... The Eurasian Union could provide an ‘economically sound and balanced partnership' with the European Union." this headline introduces a news story that many will recognize as a long-expected development in the fulfilment of Bible prophecy. For over 150 years prophetic watchmen have looked for the day when Russia would rise to dominate and control all Eurasia. That is now Vladimir Putin’s stated goal. Certainly Russia sees herself as the power to guarantee the security of all Europe—from the Atlantic to the Ural Mountains. It is a view that answers to the prophecy of where the prince of Rosh, Meshech and Tubal is addressed by the words: "Be prepared; yea, prepare for yourself, you and all your assembly that are assembled to you, and be a guard to them." (Ezekiel 38:7). The names of the nations which are given to us through Ezekiel represent the military "company" that is to gather against "the mountains of Israel" and the people of God in the latter days (chapter 38:7, 8 and 16). These names—Magog, Tubal, Meshech, Gomer, Togarmah—are all taken from Genesis 10: 2- 3, being the nations that are descended from Japheth. Assembled with these there will be "Persia, Ethiopia and Libya" Ezekiel 38:5. As the Russian Bear was in the news during the 19th century, so we see it again and again. It is there today, telling us that God's word will come to pass, that Russia will be triumphant over Europe before she meets her doom upon the "mountains of Israel." Hezbollah’s Sheikh Hassan Nasrallah, has reportedly gloated over the Russian crushing of Georgia (who was a staunch ally of Israel)… as a defeat for Israel. Iran Today… Iran’s President Ahmadinejad has flatly stated that he wants nukes to destroy Israel. He insists that since Israel is such a small country that it cannot sustain a nuclear exchange with a much larger country and survive the onslaught and concludes that the intense collateral damage that could be suffered by Iran in a nuclear exchange with Israel is a price that he is willing to pay to exterminate Israel once and for all! The Islamic Republic of Iran poses a unique danger in today’s world, and it is a danger that is spelled out in prophetic scripture… The particular mind-set of the Shiite Ayatollahs should send a chill down everyone's spine. Iran’s particular brand of fundamentalist Islam involves a heavy emphasis on the glory of martyrdom for "Allah" in the cause of destroying the infidels... (Israel and Christians) The following threat should be taken seriously: "If Israel fires one missile at Iran’s Bushehr atomic power plant, it should permanently forget about its own Dimona nuclear centre, where it produces and keeps its nuclear weapons, and Israel would be responsible for the terrifying consequence of this move." This infers that Iran already has at least a few deliverable atomic bombs. If that is a certainty, you can rest assured that Russia is already aware of the fact! Israel has stated publicly before the whole world that it will not allow Iran to acquire a nuclear weapon! The world and its leaders are coming against Israel… "The apple of God’s eye" and the Lord Almighty is about to come against the nations of the world who are attempting to inflict harm upon her! Jerusalem has become the immovable rock; Zechariah 8:13; 12:3 and 12:9. When Israel gained control of the entire City of Jerusalem in 1967, and subsequently declared it to be the eternal capital of the State of Israel, anyone familiar with the innermost convictions of the Jewish people can vouch for one certainty: Israel will never voluntarily yield up control of Jerusalem! Zechariah 12:2 - 3; describes the reaction "of all the surrounding nations." These are of course all the Muslim nations of the Middle East. For them Jerusalem under Jewish control has become "a cup that sends them reeling." One Bible reference to this is "an intoxicating cup!" A drink that is so intoxicating that the nations who taste it no longer retain full control of their actions. They can no longer act rationally, like people who are either drunk or drugged. This intoxicating ingredient is already at work among the Muslim nations. It could perhaps be defined as "demonic Fanatism." It has called forth attitudes and utterances so extreme and hateful that they cannot be considered rational. The "intoxicating" ingredient has provoked a call by various Muslim leaders and nations for a "united Jihad" – or "holy war" – to recover Jerusalem from the Jewish people. So far, however the endless rivalries of the Muslim nations have kept them from uniting effectively to carry out their purpose. 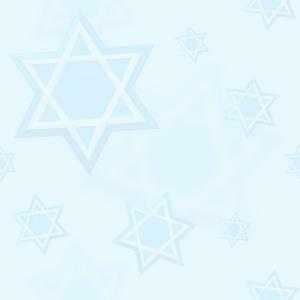 Anti-Semitism is always ultimately directed at God. Whenever His chosen people are mistreated, God feels the blow, for they are His own. The Old Testament gives a thorough history of anti-Semitism from its inception. Israel’s next war… Israeli Military analyst state that the 1991 long range missile strikes were most probably a foretaste of Israel’s next major war. That war will not be fought on some remote battlefield like the Sinai Desert or the sparsely populated Golan Heights by soldiers backed by tanks and artillery fire and supported by air force jets and helicopter gun ships. That next big bust-up, which seems to be on its way after Palestinian’ quest for a statehood with borders preceding 1967, will undoubtedly feature ballistic missile attacks on urban centres. Most chillingly, missile warheads are likely to contain chemical weapons and could even carry nuclear ones! Israeli military planners, at the request of the government, have drawn up several scenarios as to how Israel’s next war might begin and who might be involved. The speculative forecast does not foresee an end to the danger of regional military confrontations if a final ‘peace accord’ is signed between Israel and the Palestinians or Israel and Syria. The Byzantine Middle East – swirling with ancient religious passions in countries run mostly by Islamic dictators and always full of complex crafty plots – it’s simply too volatile to put away their guns for good. Peace packs are merely ‘pieces’ of paper that may not be honoured over time! The late Yitzhak Rabin warned that 100 years of violence and hatred could NOT possibly be overcome by the mere stroke of a pen! Most war scenarios are set to start with a complete breakdown of the slow moving Arab – Israeli peace process. The spark is usually an unresolved struggle over who gets what in Jerusalem! It seems most likely that the outline for Israel’s next war is found in the ancient Hebrew Scriptures and it is located in Psalm 83 and we firmly believe that Psalm 83 fits this prophetic category and is hardly a poetic praise. It is a heartfelt cry to God for deliverance from the Psalmist violent enemies. Asaph clearly identifies his foes after revealing that they are hatching a malignant plot against Israel. 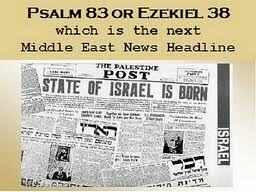 Was the Psalmist Asaph foreseeing in Psalm 83 a distant end-time plot against the restored nation of Israel? It is quite interesting to note that modern descendants of all the listed conspirators took part in the 1948 and 1967 pre-planned assaults upon Israel. Is this a co-incidence? We suspect not! In summary, the modern countries where the 10 ancient people groups were once situated are; Saudi Arabia, Jordan, Lebanon, Arabs in Israel, Iraq and properly Syria. Although Palestinian Arabs were not a significant power in 1948 or 1967 they were at the political centre of the wars that broke out in those years. Arabs from each of these areas took part in Israel’s two most important wars. Pain felt in the nation of Israel radiates to all capitals of the world! Who is interested in what happens to Jerusalem? The Vatican and the Pope drool over Jerusalem. They have used political, religious and economic influence to get their hands on Jerusalem. They even signed an agreement on 15th February, 2000 with the Palestinians calling for Jerusalem to be shared between the three ‘great world religions.’ Israel did not agree to this! Why did the Vatican side with Islam? Did they forget Islam is the religion that persecutes and imprisons Jew and Christian? They also stated that they wanted to share Jerusalem with Muslims and Jews. This was an attempt not only to legitimize Islam and their claim on Jerusalem but also the Catholic Church’s claim. Muslims… are interested because they claim the Dome of the Rock as the third holiest site next to Mecca and Medina. Military Leaders… of the world are interested because they may be involved immediately in some action or be slowly drawn into a crisis as it develops further. Even if Jewish people… have never set foot onto the soil of Israel, they are tied to it, as one rabbi remarked, "Like one who is tied to a dialysis machine." Political leaders… around the world are interested because governments can topple depending upon which side of the Jewish question they take. For example; the Italian government toppled October 17, 1985, over the hijacking of the cruise ship, ‘Achille Lauro,’ in favour of a government more favourable to Israel. The news media… are interested because Israel’s tragedies and triumphs propel themselves to the headlines of reality. When Israel makes the news it is usually ‘earth shaking,’ and that sells newspapers. If there is anything at all on the evening news about Israel it usually becomes the lead story and occasionally becomes the only story. World markets… are interested because much money can be involved. Economic ties with Israel are world-wide. The stock market, the gold market and banking can easily get the jitters when Israel makes news. Christians… are interested because news from Israel is often tied directly to Bible prophecy. Yeshua (Jesus) our Jewish Messiah was born in Bethlehem, and crucified in Jerusalem and will soon be returning there on the Mount of Olives.